Come on a journey of discovery with me – from identifying the very big, to the small. I’ll tell my tale of through the images below. Meet the Humpback Whale BCX1188 nicknamed “Jigger” for the now faint fish-hook shaped scar on his/her right fluke. 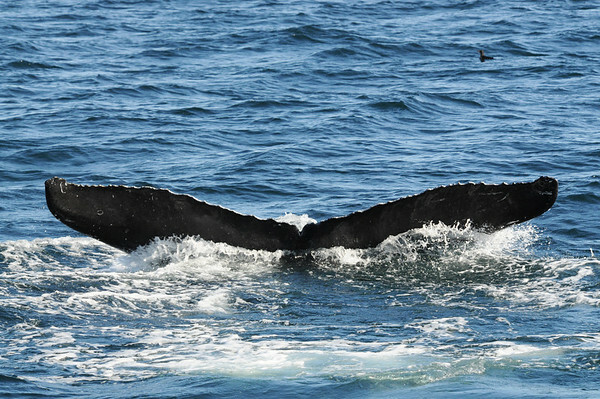 When we saw Jigger in 2009, we noted the barnacle growing on the right top of his/her dorsal fin. 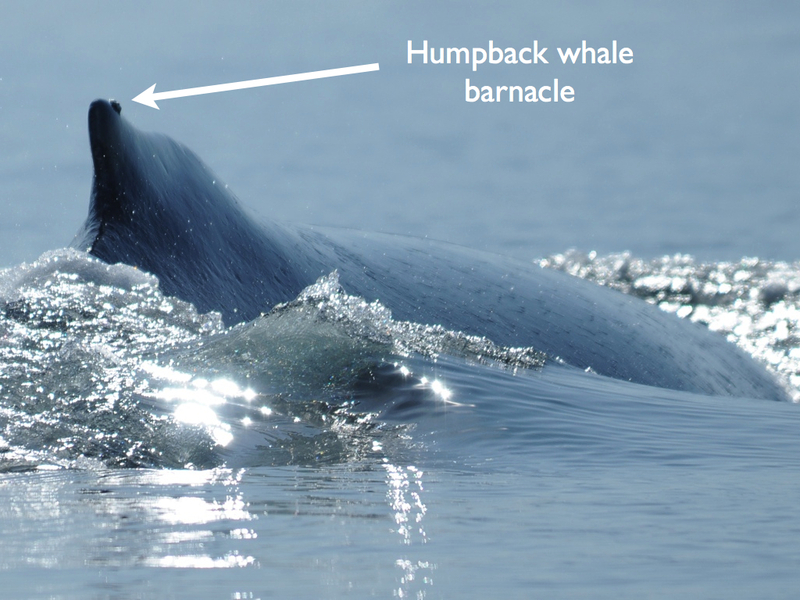 Such barnacles are a distinct species only found on humpback whales. The Humpback Whale Barnacle is Coronula diadema. This is one of our flank ID shots from 2009. 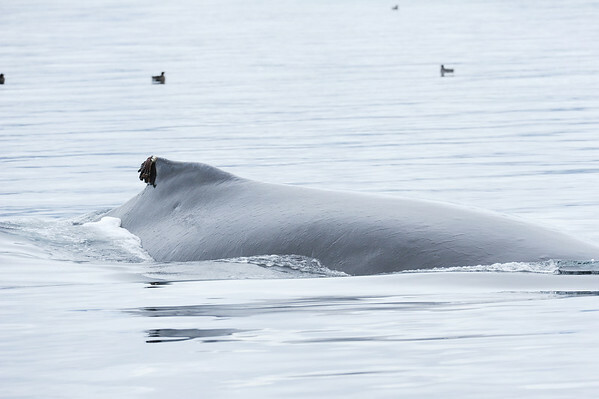 You’ll note that the Humpback Whale Barnacle on Jigger’s dorsal fin is quite hard to see. Then, when we saw Jigger in August of 2010, we noted that the dorsal fin looked very different. My research partner from the Marine Education and Research Society, Christie McMillan, and I were worried that it might be an injury so we tried to get a better photo of the dorsal fin. Here’s what the dorsal fin looked like from the left. When I had this perspective, I thought that what we were looking at might be seaweed growing on the Humpback Whale Barnacle we had seen the year before (note that the barnacles often do fall off between years). But, it didn’t quite look like seaweed. With patience and good camera lenses, we got a better look. What on Earth?! 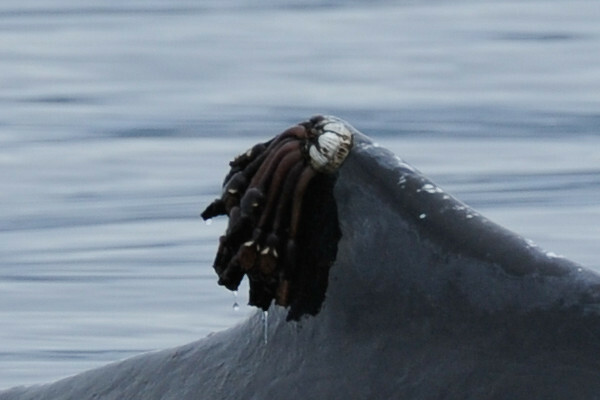 They’re gooseneck barnacles growing on the humpback whale barnacle! Gooseneck barnacles are an order of barnacles that are attached to a hard surface by a long stalk that looks like a goose’s neck. They depend on the motion of the water to feed on plankton as they do not have the “foot” (cirri) that rakes in plankton in many other barnacle species. That’s when I learned that there is a species of gooseneck barnacle that, in the North Pacific Ocean, most often grows on the Humpback Whale Barnacle!!! The species is the Humpback Whale Gooseneck Barnacle, Conchoderma auritum. This is the kind of discovery that causes wonder and euphoria in my world. 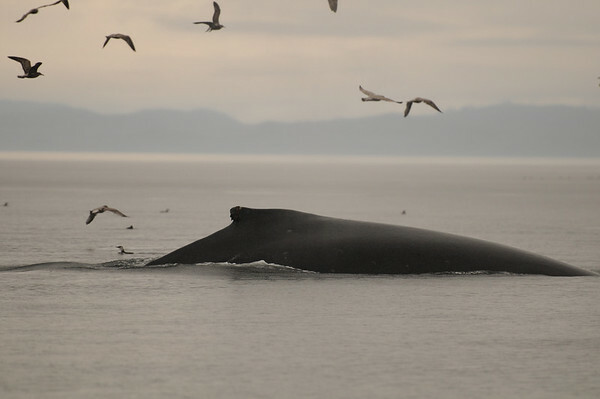 To be able to identify a Humpback as an individual is already something of great scientific and educational value. 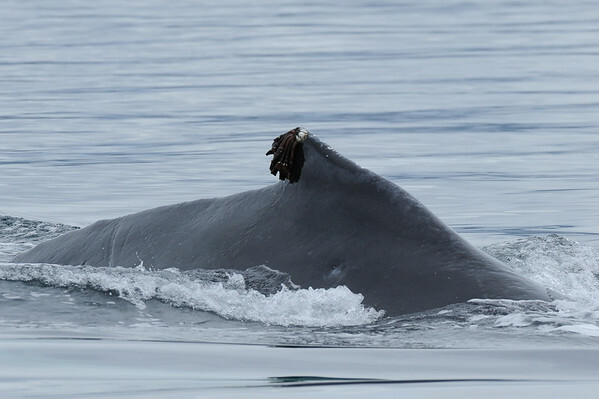 That this attention to an individual whale leads me to learn that there is a species of gooseneck barnacle that grows almost exclusively on a species of barnacle that only grows on Humpback Whales = sheer wonder. I can’t wait to find out what else the Humpbacks are going to teach me! How EXTREMELY interesting…..thank you for sharing with us! Hello Kathy, I really appreciate the feedback and knowing that the effort in sharing this is worth it since there are people like you who share my fascination with discoveries like this! Wow! Talk about having a specific niche. Thanks for sharing such an amazing observation! Jackie, this is sooooo amazing! I think you also have a specific niche! Who else puts the time and energy into sharing this fascinating stuff… makes me imagine ‘decorator humpback whales’ out there. Nature never ceases to amaze!